Take in the city skyline in Washington DC on an all-you-can-eat buffet cruise. Board a luxury boat for a sightseeing cruise on the Potomac River with dinner and dancing while a DJ spins your favorite tunes. Pass by illuminated landmarks such as the Washington Monument and feast on a variety of delicious dishes during the 4-hour tour. 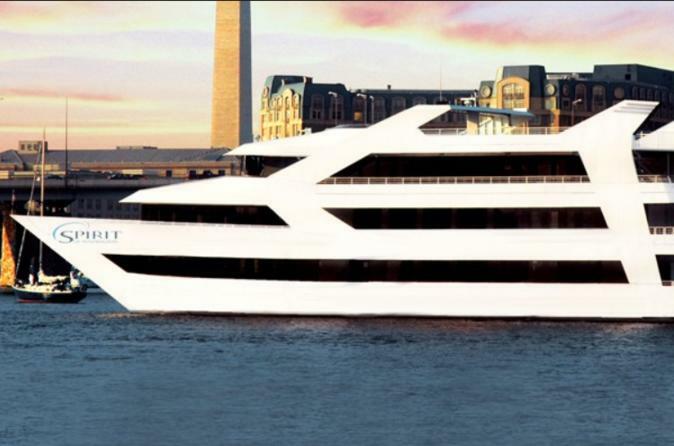 Meet for this 4-hour cruise at Washington DC's Pier 4 on New Year's Eve night. Boarding the cruise ship starts at 8 p.m., and the boat takes off at about 9 p.m. There are three seating options to choose from for this cruise (prices vary). At the end of your 4-hour cruise your ship docks back at Pier 4 at around 1 a.m.